So far just a single grower in Massachusetts has been approved to start sowing marijuana seeds for adult-recreational use. The first crop of pot will be ready to harvest in the fall. And the state has high expectations that suppliers of marijuana to shops will go green. New regulations set strict limits -- some of the toughest in the nation -- on the amount of energy growers can use to raise their plants. The Cannabis Control Commission's Energy Working Group traveled around the state to hear the concerns of growers and about the new energy regulations. “We understand that marijuana cultivation and product manufacturing is one of the most energy-intense industries that there is right now,” says Commissioner Kay Doyle. The energy footprint of a typical indoor pot-growing facility is eight to 10 times that of a similar size office space. One study found 3 percent of the electricity used in California went for raising weed. Doyle says that is why the CCC needs to enforce the energy regulations from the start. "We want to make sure that it is not something that throws us out of whack with the Global Warming Solutions Act,” she says. That 2008 act requires Massachusetts to cut greenhouse gas emissions by 80 percent by 2050 from 1990 levels. But the energy needed to grow a single pound of pot indoors can put 5,000 pounds of climate-changing CO2 into the atmosphere. Peter Bernard is helping to solve the problem with an active, but laid-back, approach. On his porch in Taunton, he grinds up some homegrown, fills a rolling paper, and lights up. 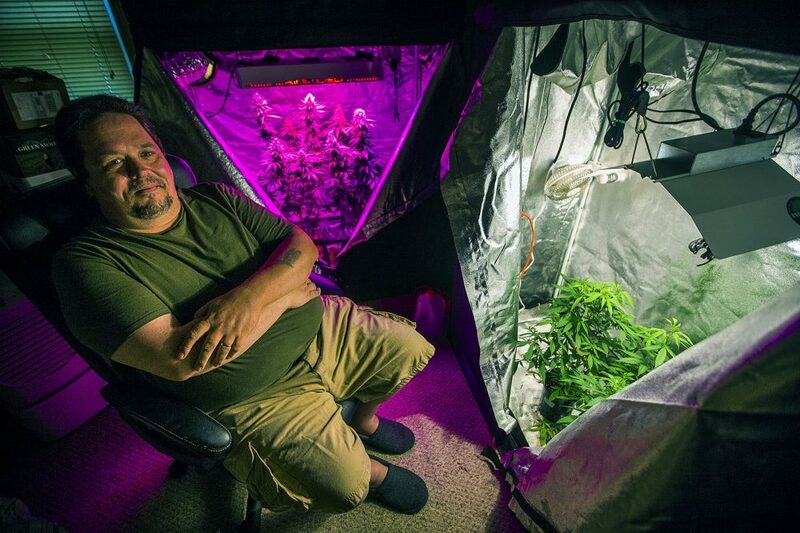 Once a type-A tech guy, Bernard began growing medical marijuana after hurting his back. Now he is executive director of the Massachusetts Growers Advocacy Council. 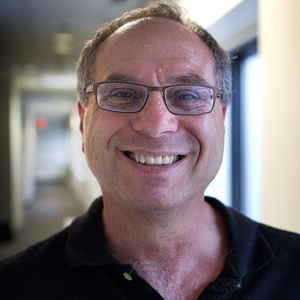 He represents cultivators large and small, helping craft growers and corporations navigate the complex state marijuana regulations. “If I'm talking to a legislator or a regulator and I'm trying to be all proper, it's cannabis," he says. "If I'm talking to my friends, it's weed or, 'Let's smoke a bone.' "
Bernard runs the council out of his home, where he also raises his private stash. A window air conditioner and dehumidifier hum in the background. The electric bill for his small grow room runs about $110 a month. The plants Bernard cultivates look very content; two stalks of Blue Dream have big flowering buds. They grow under a purple light cast by an expensive LED lamp. Nearby, in a separate reflective tent, two Blue Magoos are bathed in yellow, growing under a low-cost ceramic metal halide lights. During the 70-day flowering season the lamps are on 12 hours a day. Bernard’s small crop highlights the challenges large producers will face trying to meet the new state energy regulations. Those growing over 10,000 square feet of pot are limited to 36 watts of power per square foot of canopy. For smaller commercial growers the limit is 50 watts. Bernard acknowledges the regs are complicated. Or, you can use renewables. The regulations state that if a commercial grower gets 100 percent of their energy from resources off the grid, they can use as much electricity as they want. Alternatively, growers can think inside the box. 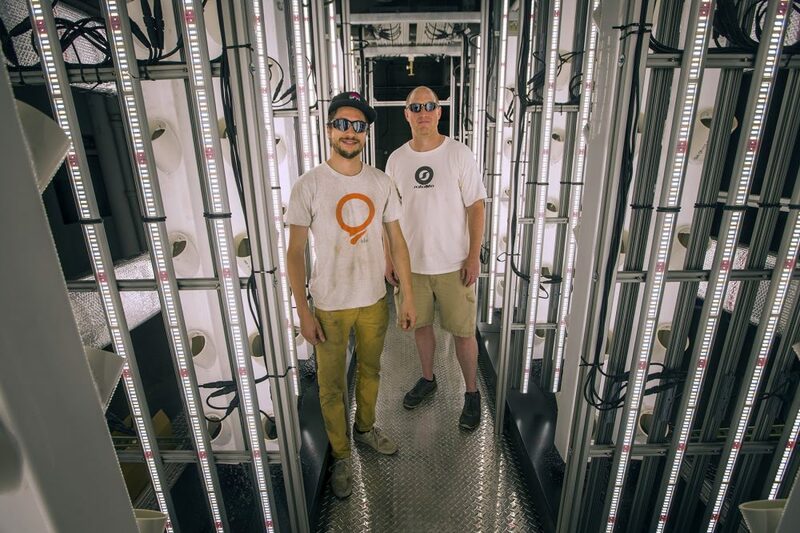 Chris Denaro, co-founder and chief tech officer of STEM Cultivation, built a prototype of the company's system in a Salem warehouse. "Basically, this is going to be a prebuilt modular grow system," he says. The STEM Box is designed to use science, technology, engineering and math to produce pot the most energy efficient way, says Denaro. "As a mechanical engineer this was a dream project for me," he says. "I got to just take all of the coolest technologies and put together a system to help maximize yield and efficiency of growing." The STEM Box is a self-contained, vertical, hydroponic pot farm. Roots, mounted in 24 plastic columns that slide in and out for harvesting, are automatically fed precise amounts of water and nutrients. 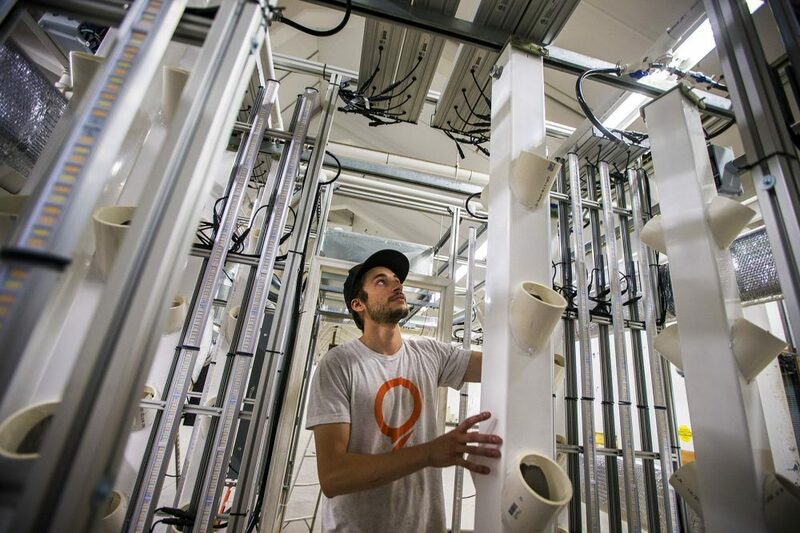 A 5-ton AC keeps 240 plants Goldilocks happy. The LED lights are so bright you have to wear shades. The state-of-the-art LED bulbs lining the STEM Box are made by a Massachusetts company. The lights are intense and positioned just right to maximize plant canopy exposure. 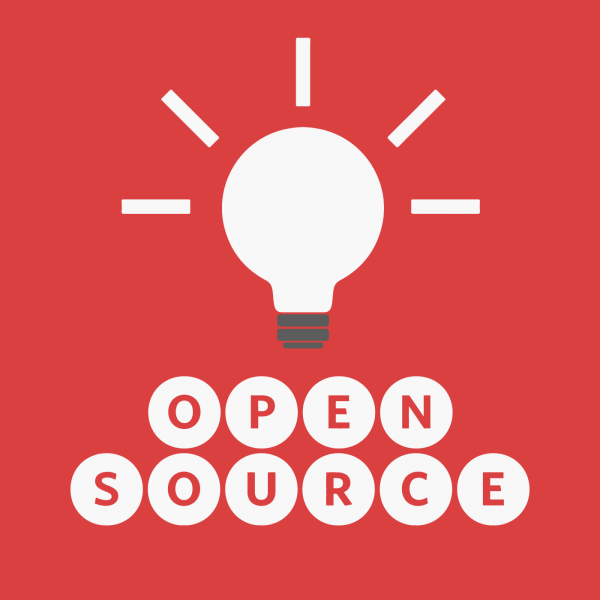 “To us, efficiency equals cost. More efficiency, lower cost. It's as simple as that,” says STEM Cultivation CEO Kyle Moffitt. 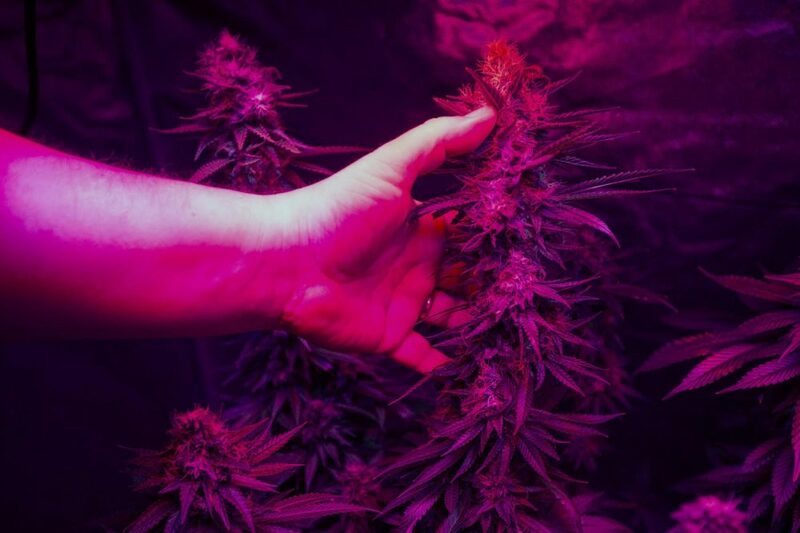 He is the money guy and estimates that in the three months it takes to grow 40 pounds of pot in a STEM Box, the system will use the same amount of electricity as the average home in a year. The STEM business model has licensed growers renting the boxes and growing the plants. They can add to the module 10 x 10 x 25 boxes as demand for recreational pot increases. Moffitt says the STEM startup needs seed money to begin production. He’ll grow pot to grow the business. Moffitt predicts the future of STEM is bright. “It could get big fast because our objective is so clear," he says. "We're trying to figure out what is the absolute most efficient way to grow cannabis -- really any plant, and that's why we call it a universal agronomy system. It can be used for anything." Marijuana could be the tip of the iceberg. Lettuce that is. There are already a few companies in Boston using hydroponics in shipping containers to raise crops like lettuce. Energy consultant Sam Milton, principal with Climate Resources Group in Arlington, says the lessons learned from efficiently cultivating could lead to much bigger ambitions. “For me the exciting part about this industry is that I see it as a bridge to a future where we have real sustainable urban agriculture where we're growing the plants we need to feed our community here in Boston," Milton says. So imagine: energy efficient, sustainable, vertical, indoor farming that can one day feed a hungry world. Pioneered, in part, by pot. This segment aired on June 29, 2018.